K. Hovnanian® Homes® is proud to announce Park Central at Cypress Key Townhomes, a distinctive community of 124 elegant townhomes in Royal Palm Beach, Florida. Park Central at Cypress Key also offers 23 single family homes. This appealing community is in a sought-after location near Wellington in Palm Beach County with everyday conveniences, shopping, employments centers, and a wealth of cultural and natural opportunities. Parks, world-famous golf courses, and many trails for hiking, biking, and running dot the landscape. Wellington is a renowned location for the equestrian community and horse lovers. Beautiful beaches are less than 15 miles away. Children will enjoy A-rated elementary and middle schools. 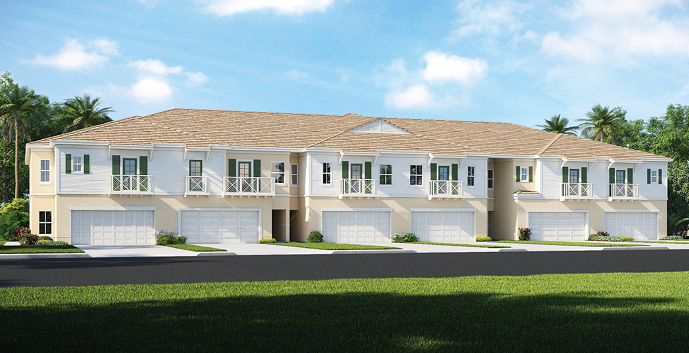 Park Central at Cypress Key offers 7 models of 2 story townhomes. Marsa - 2 story townhomes, 3 bedrooms, 2 and 1/2 bathrooms, great room, dining area, covered lanai, porch, loft, balcony and 2 car garage. Jasmin - 2 story townhomes, 3 bedrooms, 2 and 1/2 bathrooms, great room, dining area, covered lanai, porch, loft, balcony and 2 car garage. Tresco - 2 story townhomes, 3 bedrooms, 2 and 1/2 bathrooms, great room, dining area, covered lanai, porch, loft, balcony and 2 car garage. porch, loft, balcony and 2 car garage. Jasmin II - 2 story townhomes, 3 bedrooms, 2 and 1/2 bathrooms, great room, dining room, cover lania, porch, loft, balcony and 2 car garage. Viscaya II - 2 story townhomes, 3 bedrooms, 2 and 1/2 bathrooms, great room, dining room, flex room, covered lania, porch, loft, balcony and 2 car garage.